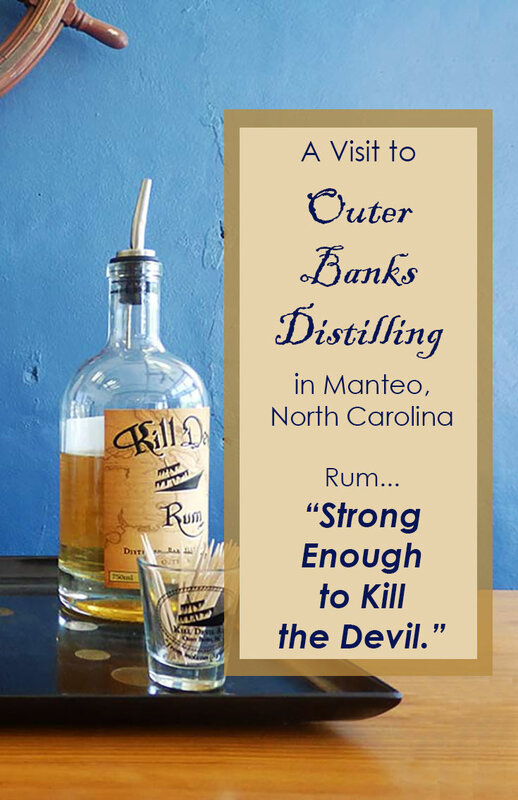 On a visit to Outer Banks Distilling, in Manteo, on the beautiful North Carolina Outer Banks, prepare to be shocked… then delighted… and then oh so mellow. Raw rum, right from the still is…an experience. A pretty shocking one at that. As a small glass of the stuff was handed to me, I wasn’t sure what to expect. I held it to my nose. Whoa! The fumes knocked my head back. Gingerly, I brought mouth and glass together and sipped. Whoa again! At first touch, my lips were burning. Within seconds, my tongue was numb. “At this point, it’s 180 proof,” said Scott Smith, one of the four owners of Outer Banks Distilling, who was leading my group on a tour. “It’s got a long way to go before it’s drinkable.” He was not exaggerating. I’m not a heavy drinker by any stretch, but I do like rum. It has long been my spirit of choice. Hot and buttered, mixed into a Cuba Libra, with a tropical Latin touch a la mojitos and piña coladas, most of the cocktails I actually enjoy include rum. So I was delighted to have the opportunity to visit the first “legal” distillery on the Outer Banks of North Carolina. Even better was the chance to taste several of their flavored Kill Devil Rums and see where and how these deeply-flavored spirits are made. Note: My trip to Outer Banks Distilling was sponsored by the Outer Banks Visitors’ Bureau, to whom I am very grateful. Their generosity had no effect on my opinions expressed here. I truly was blown away. Opened in 2015, the distillery was started by four local pals—two brewers and two bartenders. Bonded by their common love for good beer and rum, they decided they wanted to kick the Outer Banks alcoholic scene up a notch. They started a self-designed crash course in rum, including the horrible sacrifice of sampling as many kinds of rum as they could get their hands on. They taste-tested rums from the Caribbean, from Fiji, and from other US craft distilleries. 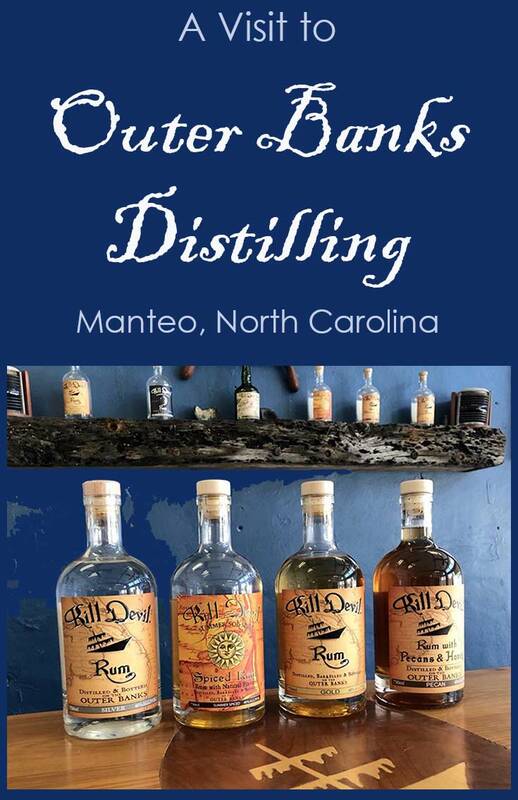 They took university courses in distilling and tried and tested everything they were learning until they were satisfied they could produce a world-class product right on the Outer Banks. As a first step. they found a perfect 65+-year-old brick building in the town of Manteo, reinforced the floor with concrete to bear the weight of four 1200-liter tanks and the 300-liter copper pot still from Arnold Holstein, a world-renowned manufacturer of distilling and brewing equipment. Beautiful in its industrial detailing, it looks for all the world like a giant copper oboe standing upright in a stainless steel tub. 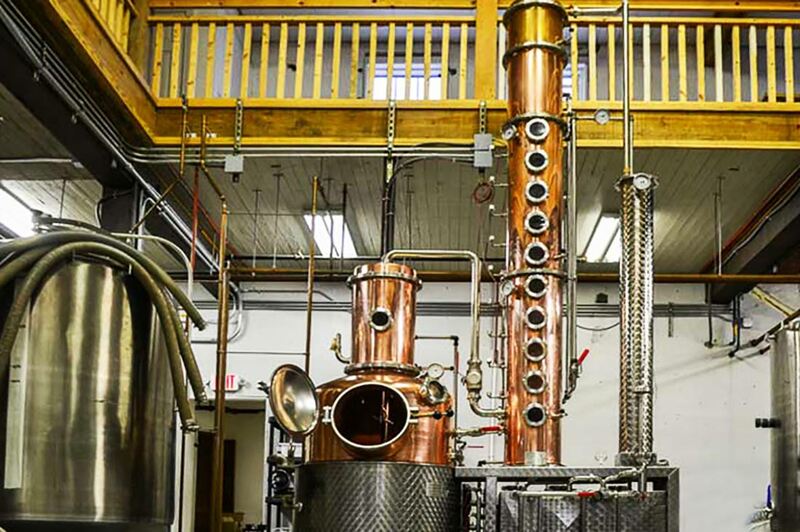 The 300-liter German copper pot still at Outer Banks Distilling is a beautiful piece of equipment. Formal studies and travels behind them, the foursome brought in their first barrels of molasses, thick and dark and oozing. They fired up that beautiful still. And then they made their first batch of Outer Banks Distilling Kill Devil Rum. In the short 2½ years since, they’ve racked up several international awards. The name of the rum they create actually has two sources. The first is the Kill Devil Hills, just north of Manteo. In earlier times, rum was made almost exclusively in the Caribbean, the source of the sugar cane that created its molasses base. After manufacture, more than a little of that rum was shipped north. Unfortunately, some of the ships didn’t make it to their destinations. Instead they were caught in the shallow shoals that line the North Carolina Outer Banks—often referred to as “The Graveyard of the Atlantic.” In those turgid, shallow waters, many foundered and sometimes broke up, and barrels of rum washed ashore…a fact the locals did not seem to mind at all. Delighted with their windfall of rum “strong enough to kill the devil,” locals fondly began calling the area the Kill Devil Hills. 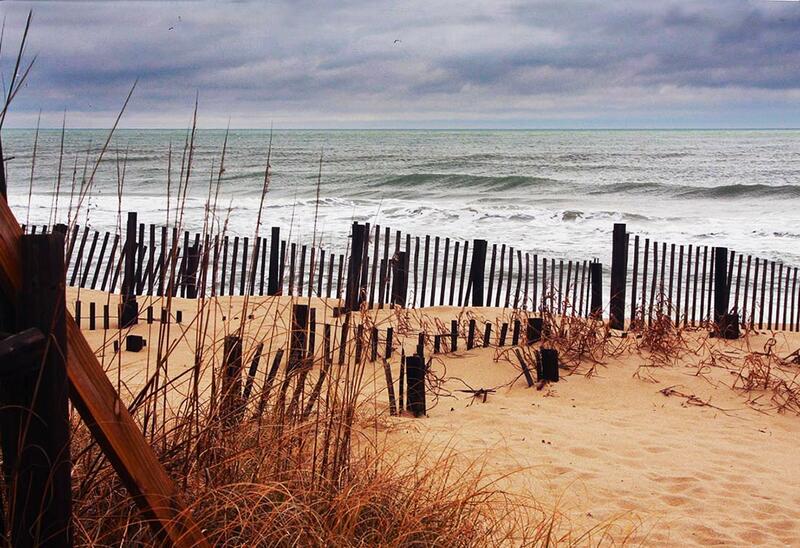 Three of the distillery’s four partners live in these beautiful sandy dunes. that have been wrecked on its rocky shoals, sometimes washing barrels of rum ashore. The second name association is the rum itself, and it goes even further back. In 1650, rum from the Barbados was called “Kill Devil.” The owners liked the double meaning and its association with the location. Kill Devil Rum was born. Good molasses is still at the heart of making good rum. Today the distillery gets most of its molasses from sugar-cane fields in Florida and Louisiana. “We just don’t grow sugar here in North Carolina,” Scott explains. Sometimes demerara sugar is also added. They use yeast from the island of Guadaloupe. For their specialized, small-batch rums, it’s the balance of molasses, demerara, and the type of barrel used for aging that tells the tale, affecting the flavor profile and highlighting the versatility of rum. After it emerges from the huge copper pot still, that nose-widening, mouth-numbing spirit I tasted is blended and aged. One of the goals of the foursome of owners is to show the wide variety of styles of rum that can be produced. They turn out silver, gold, aged, and seasonal spiced rums. These varieties are aged in a range of barrels that affect the final flavors, including used Jim Beam bourbon barrels for their signature Gold Rum. 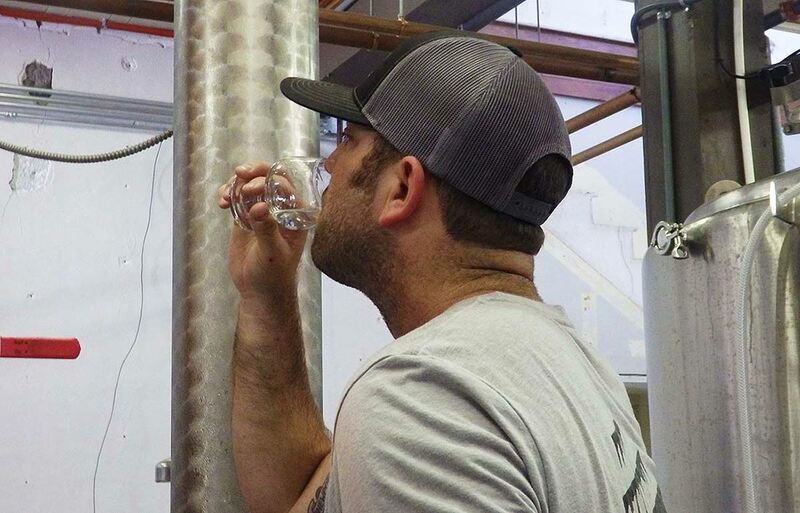 Outer Banks Distilling co-owner Scott Smith tastes the 180 proof pure spirit rum straight from the still. The distillery offers tours for guests over 21, by reservation, in their lovely, wood-lined tasting room. I found the tastings eye-opening. My favorite was the Kill Devil Pecan Rum with Honey. Creamy smooth, with a light honey-sweet finish, it seemed to kiss my tongue. It was inspired by the giant pecan trees surrounding the distillery. Both the pecans and the honey are locally sourced. A delightful by-product, the rum-soaked pecans are candied, packaged, and sold in the distillery. We also tasted the their flagship rum, Kill Devil Gold. Its rich color and depth of flavor come solely from aging in those bourbon barrels. No flavors or colors are added. When Gold hits your tongue, there’s a sudden feeling of evaporation that leaves behind a hint of sugar and cream. 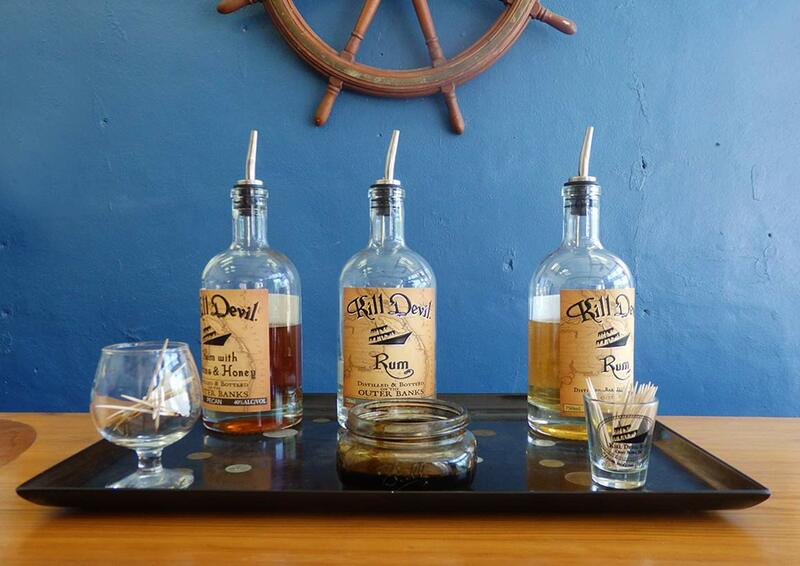 Kill Devil Silver is their example of rum in its purest form. The molasses comes through, lightly touched with notes of vanilla and créme brûlée. It’s an excellent rum for mixing into cocktails. Pouring the tastings. Tours and tastings are available by appointment. 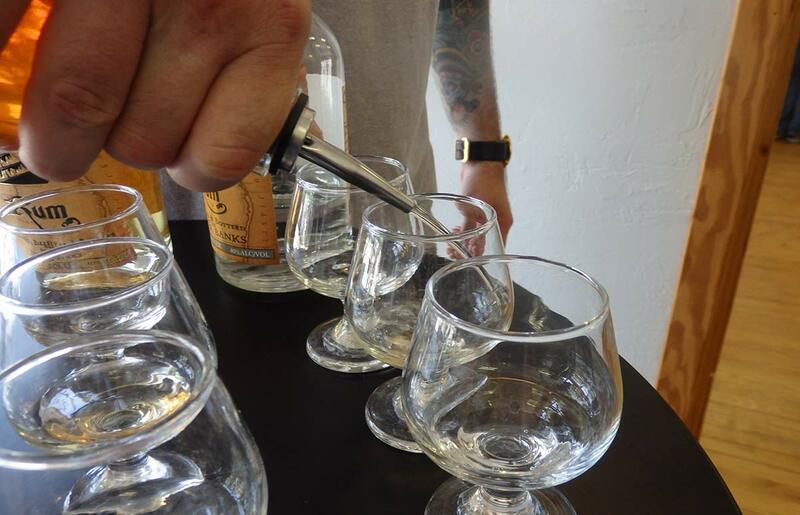 Finally, the distilling foursome has fun a few times a year with their specialty rums. Once a year, they drop a new version in their “Shipwreck” series—another homage to their location. Twice a year, at the winter and summer solstices, they bring out their very popular Sol-Spice creations, which commonly sell out in hours, if not minutes. This year, their 2018 Summer Sol-Spice version was barrel-aged and then spiced with a Thai accent—with kaffir lime, lemongrass, and ginger. Last year’s Winter Sol-Spice Rum was aged in once-used apple brandy barrels and flavored with coffee, cocoa nibs, vanilla and cinnamon. Last year’s was made with two different kinds of orange peel, lemon peel, and coriander. Just imagine the luscious combinations still to come. In the distillery’s pretty tasting room, the ship’s wheel of the schooner Irma, which sank in waters nearby, adorns the bar. 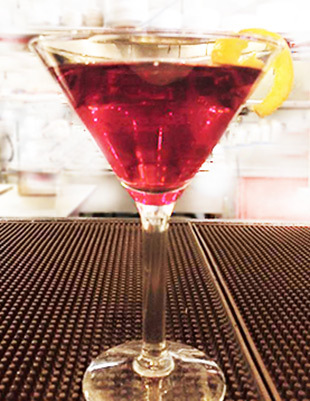 As I admitted at the start of this post… I love cocktails made with rum. And so I asked the guys from Outer Banks Distilling if I could share a couple of their cocktail recipes from their website. And they said yes! over ice. Garnish with an orange wedge. 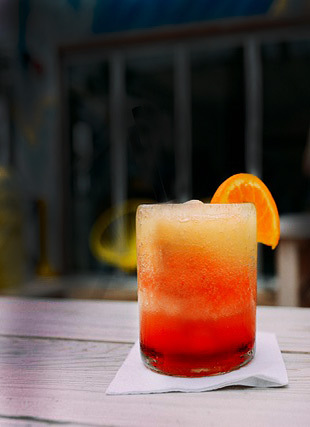 For more recipes and information about their rums, visit the Outer Banks Distilling website. Distillery tours are available Tuesday thru Saturday at 1 & 3pm by reservation. Tours cost $10 at the time of writing, and you must be 21 years or older.